BOSTON—A new survey of Harvard Business School (HBS) alumni focuses on “An Economy Doing Half Its Job”: large and midsize firms in America have rallied strongly from the Great Recession, but middle- and working-class citizens are struggling, as are small businesses. This new survey, designed by HBS faculty and conducted by Abt SRBI, is the latest in a series of annual surveys conducted by Harvard Business School’s U.S. Competitiveness Project. Every year, HBS asks its alumni worldwide to share their perceptions about the current state and future trajectory of both U.S competitiveness and the U.S. business environment. Questions focus on the structural strengths and weaknesses of the economy as well as deep dives into specific drivers of competitiveness. In addition to the annual diagnosis of the U.S. economy, the 2013-14 survey captures input from HBS alumni on three key areas of competitiveness: K-12 education, workforce skills, and transportation infrastructure. In gauging the trajectory of U.S. competitiveness, survey respondents were pessimistic on balance. A plurality, 47%, foresaw a decline in U.S. competitiveness in the next three years, while only 33% predicted an improvement. The rest foresaw no change. Like many other economic indicators in recent months, the survey findings suggest that the prospects of companies and workers are moving in opposite directions. Respondents who thought U.S. firms would be better able to compete in the global economy in three years outnumbered those who expected firms to be less able to compete. But those who predicted lower wages and benefits outnumbered those who foresaw better earnings for workers. While pessimistic overall, respondents were less negative than in past surveys. The proportion of respondents expecting U.S. competitiveness to deteriorate in three years fell from 71% in the 2011 survey to 47% in 2013-14. 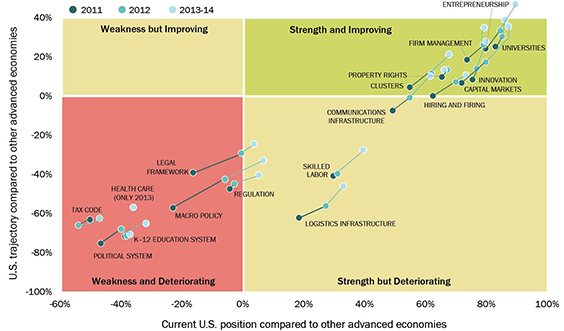 Assessments of every element of the U.S. business environment improved between the 2011 and 2013-14 surveys. The improvements seem to reflect the cyclical rebound of the U.S. economy. Compared to the typical respondent, alumni working in smaller businesses had more negative (or less positive) views of virtually every aspect of the U.S. business environment. This finding echoes growing evidence from other sources that smaller businesses are disadvantaged in America. Business engagement in America’s schools is broad—but not deep. Of the alumni working at firms with U.S. operations, 63% reported that their firm participates in at least one company activity to support schools. But only 7% of alumni respondents described their firms as “deeply involved” in public education. Business must go beyond “checkbook philanthropy” to partner better with educators. They need to support policies that enable innovation in the education system, help educators scale programs that boost student outcomes, and partner with others to craft community-level strategies that guide young people from cradle to career. Business leaders in America are reluctant to hire full-time workers. Instead, many prefer investing in technology to perform work, outsourcing to third parties, or hiring part-time workers. Only 27% of respondents reported that their firms engage with institutions like community colleges to prepare students with workforce skills. Employers need to track and share more openly the skills they require, collaborate more effectively with education institutions to develop curricula that impart those skills, and spread best practices within and across regions and industries to create a more efficient marketplace for skills and workers. Forty-two percent of respondents reported that the condition of infrastructure like airports, ports, and roads had declined over the past three years. For every respondent who thought infrastructure had improved, nearly five felt it had worsened. Just over half of the respondents (51%) said U.S. logistics infrastructure is falling behind that of other advanced economies. Business and government leaders need to work together to develop a national infrastructure strategy. This would include addressing the population shift from suburbia to cities, strengthening trade corridors such as with Canada and Mexico, and investing in high-speed communication networks. For more information about Harvard Business School’s U.S. Competitiveness Project and this year’s survey, please visit: www.hbs.edu/competitiveness & http://www.hbs.edu/competitiveness/survey/. Abt SRBI, a leading public policy and market research organization, is a subsidiary of Abt Associates, a mission-driven, global leader in research and program implementation in the fields of health, social and environmental policy, and international development. Abt SRBI is headquartered in New York City, with offices in the Washington, DC area, Chicago, IL, Cambridge, MA, Fort Myers, FL, Durham, NC, and other cities.